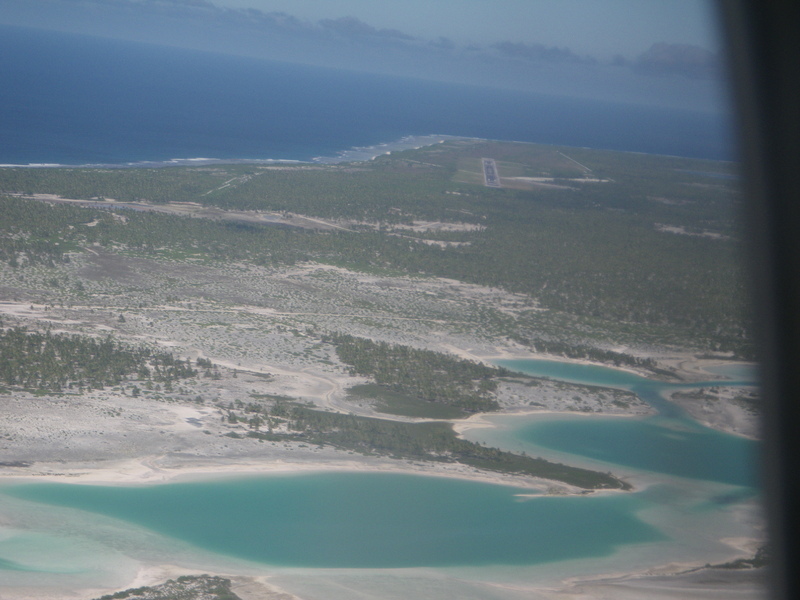 There is a regularly scheduled once-a-week flight from Honolulu to CXI, the airport on Kiritimati (Christmas island) in Kiribati. 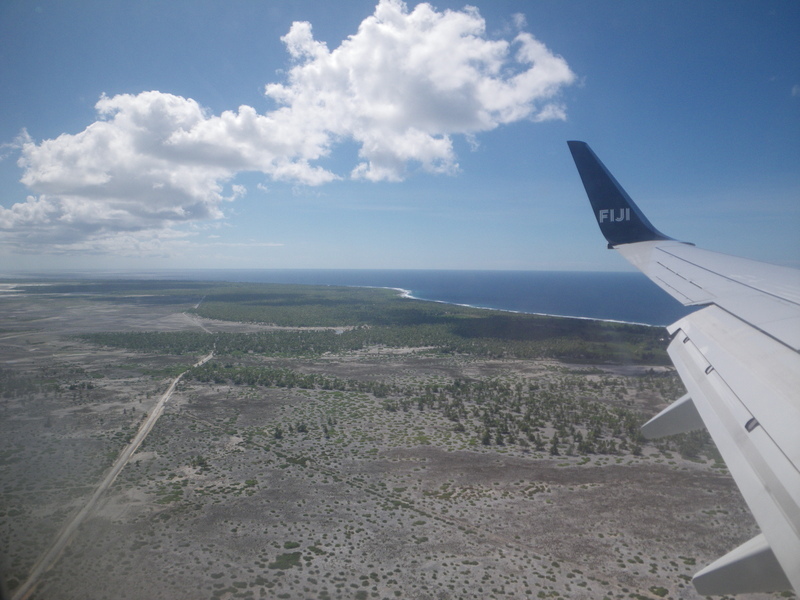 I came here to travel around 3 of the islands of Kiribati: Kiritimati, Teraina (Washington island), and Tabueran (Fanning island). I am traveling on the sailing vessel Kwai, a freighter with sails which has its own web page. 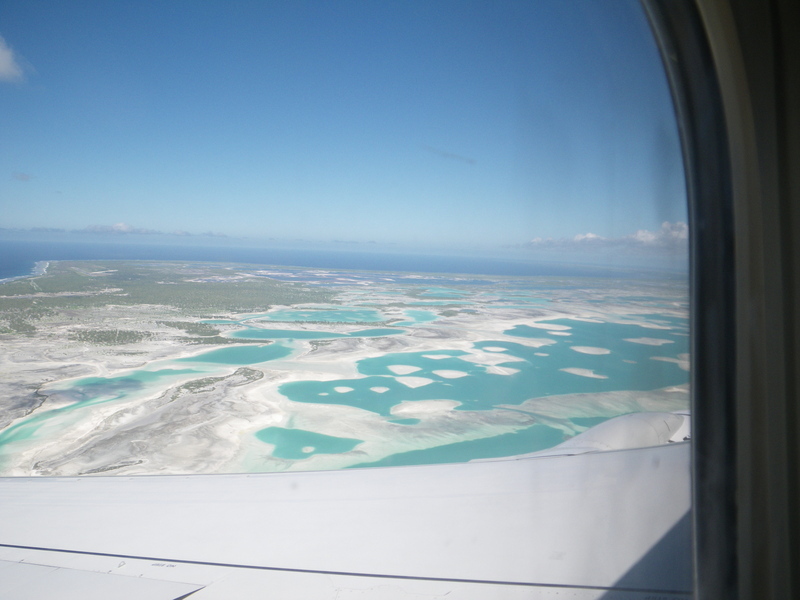 In the Kiribati language, "ti" is pronounced as "s" in English. 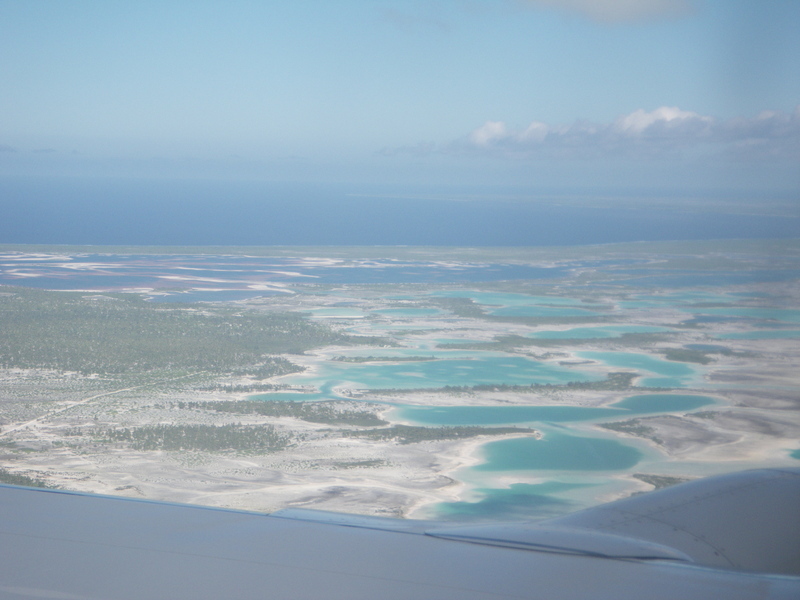 So Kiritimati is a transcription of Christmas, and Kiribati is the transcription of "Gilberts", the name of main archipelago in the country. The islands I am visiting are in a different archipelago, the Line islands, which are about a 3-hour flight South of Honolulu. 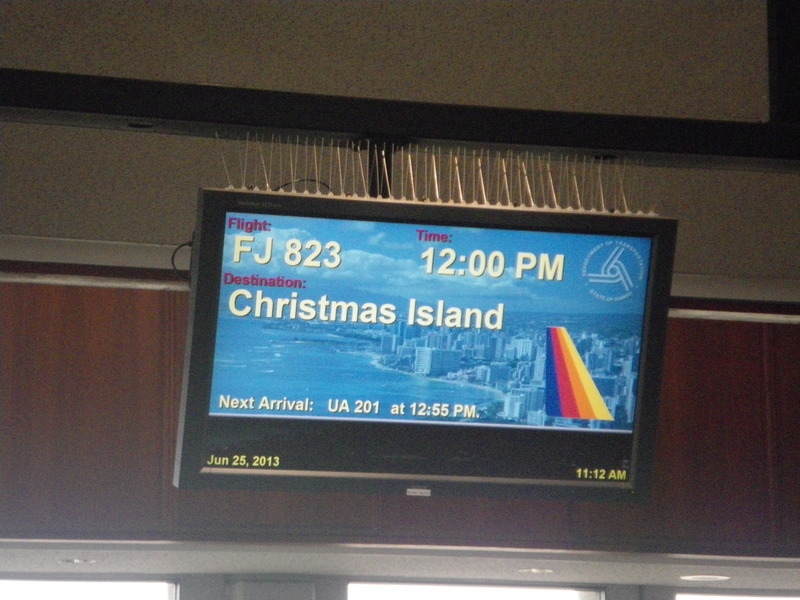 Christmas Island is about 2 degrees North of the equator. 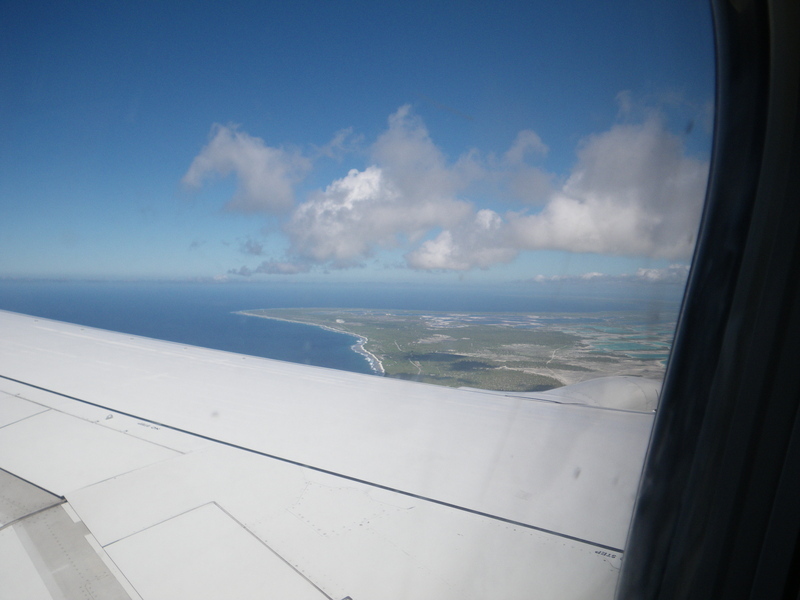 The arrival was fairly uneventful, but gave me good views of Christmas island, which is the largest island in Kiribati and the largest atoll in the world. 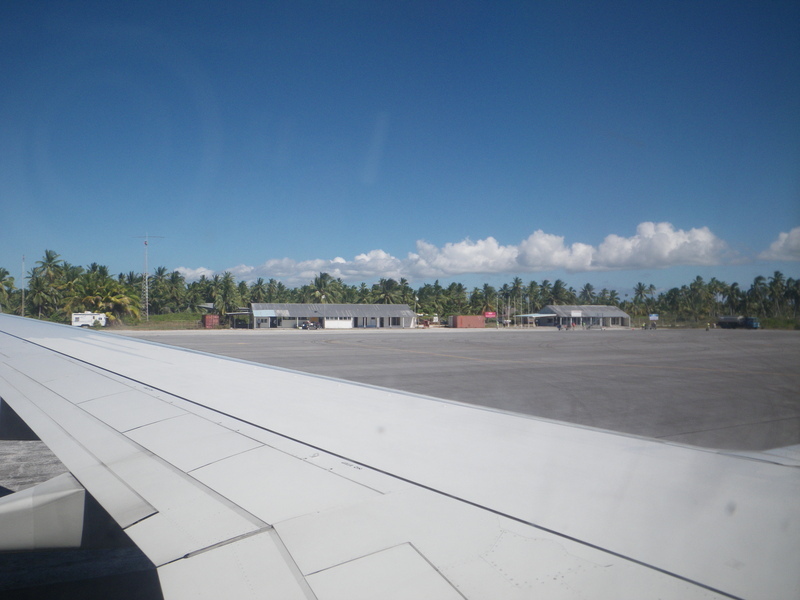 The airport has a single runway, oriented 80/260 degrees. 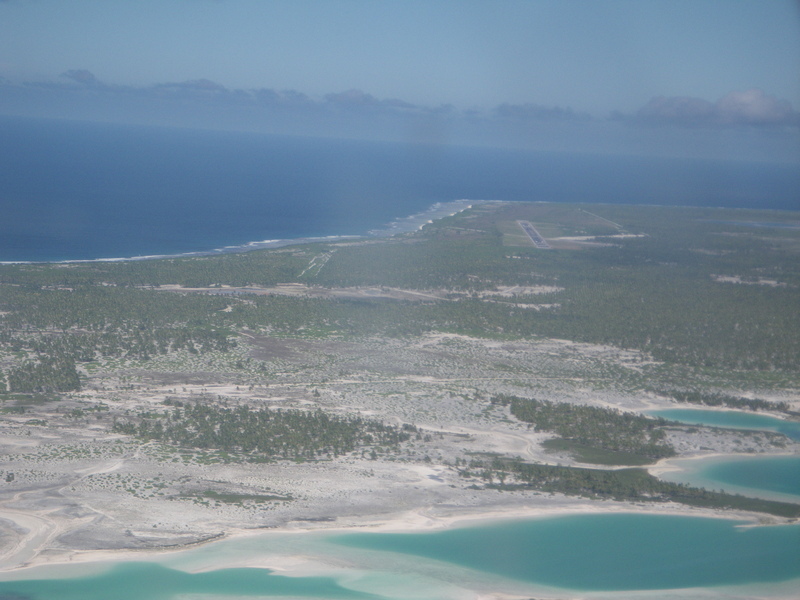 The island is sandy, but covered in coconut trees with a few beach almonds and ironwoods (casuarina equisetifolia). 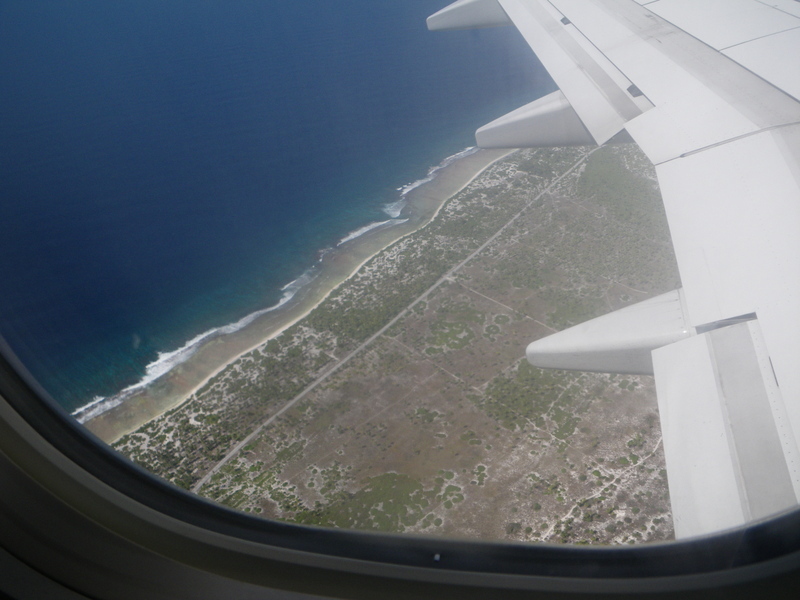 One of the people I met on the flight was coming to Christmas island for a week of fishing. He claimed the fishing was great. Christmas Island was developed in part to conduct nuclear test in the 50s (for the UK) and 1960s (for the US). 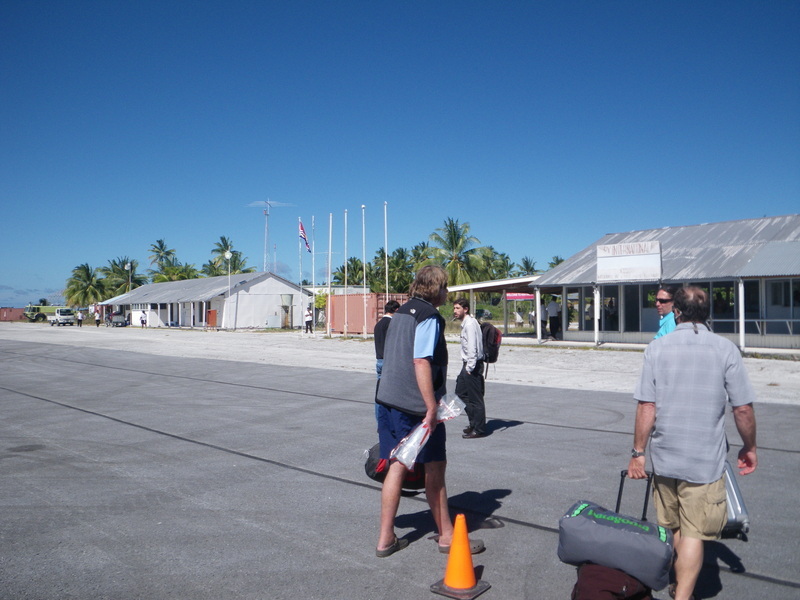 Coming to Kiribati to sail on the Kwai may be a little unusual, and the immigrations officer only stamped my passport with permission to stay for two days. Tomorrow I have to go in to another office (closer to the ship) to get permission for my full two-week stay and to go around the other islands. There does not appear to be organized public transportation from the airport, but some very friendly folks gave me a ride from the airport to the ship. They seemed to enjoy coconut wine, made from a juice that comes out of the cut stalk of the coconut flower. The juice can be drunk sweet, or fermented. The Kwai is a freighter powered by sails as well as an engine. 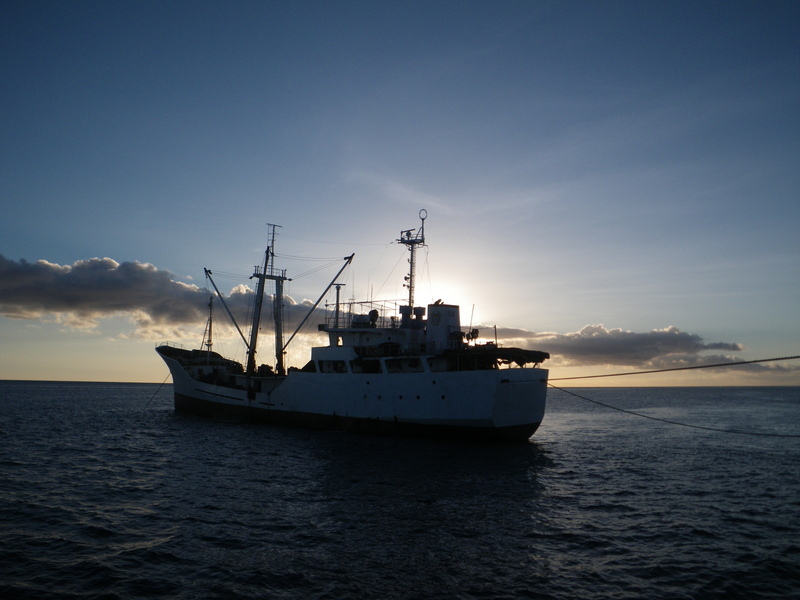 The Moamoa is another freighter serving the islands. 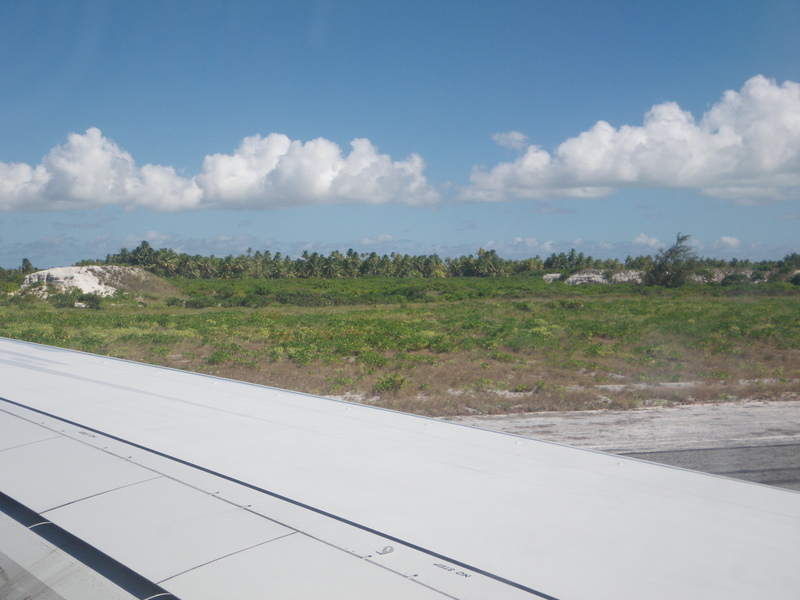 It goes all the way to Tarawa, the capital of Kiribati. 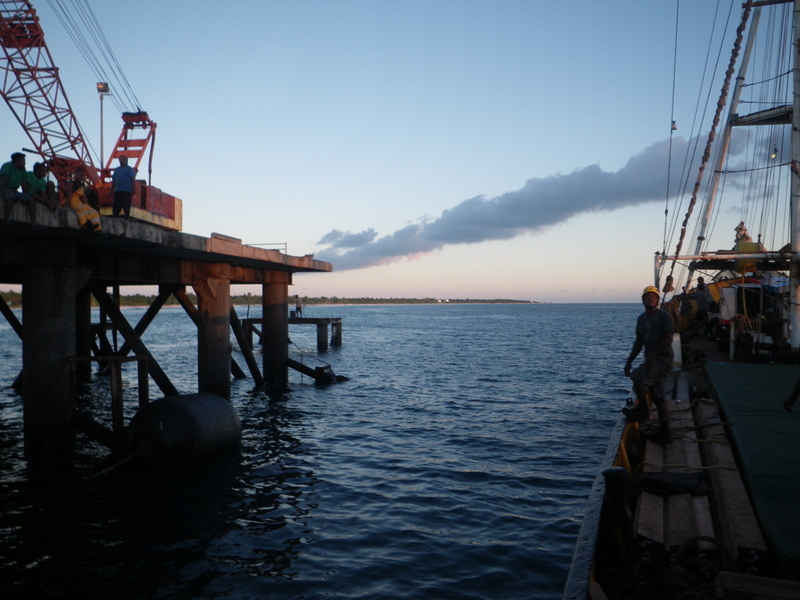 Most of the time at the dock is spent unloading merchandise. 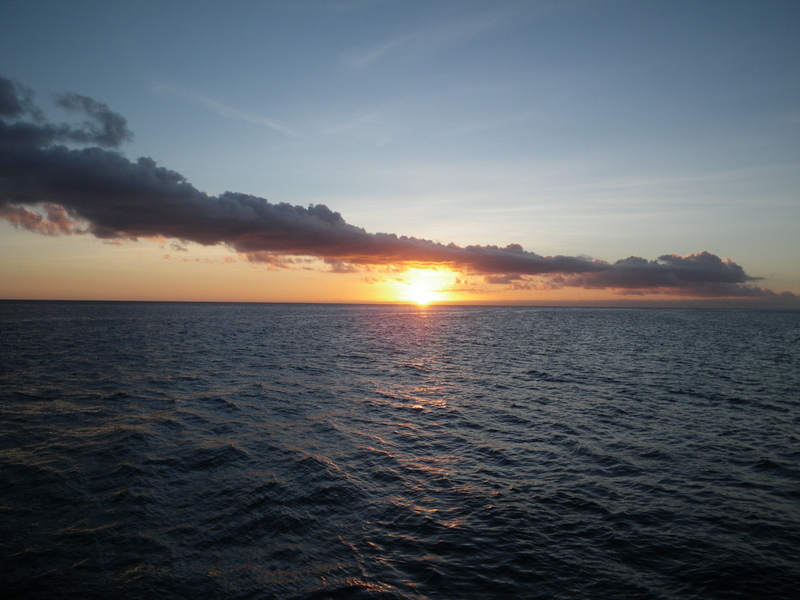 At the end of the day, we pulled away from the dock and anchored off the island, enjoying a beautiful sunset.